Aloe vera is one of the best proven medicinal and cosmetic herbs. And have you ever seen how great Aloe vera looks on a window sill? It is a real decoration of the entire space. The plant seems to be exotic and attractive. Now I recommend it to all my friends for these 2 reasons:As mentioned above, the Aloe vera leaves can be used as home medicine for treatment of both children and adults. The first signs of illnesses can be cured very fast and without side effects – it is completely safe and natural. 3. By division of tubers. – Use only propagation methods that will not do any harm to the plant. – Never do it while the succulent is blooming. – Don’t abuse with watering in summer. It is a succulent, so it is better to leave it outside on the porch for a night, so it can gather dew from the air. – You can nourish the plant with special dressings for the succulents and cactuses. Saturate the soil with mineral and nitrogen-containing fertilizers once in a while. – Be careful when transplanting pups. Young plants should be transplanted once a year, 3-years-old ones – once every 3 years. Plants older than 5 years are called old. Exactly these aged plants are the most valuable ones as they contain a plenty of health benefits. Don’t water it before planting. The soil should be dry for the purpose. After removing the plant from the pot, clean the roots of the old substrate by a light tapping. If you find damaged roots, they need to be removed without damaging healthy tissues. Sliced parts should be sprinkled with powdered sulfur or charcoal. Pruning should be performed with sharp scissors. When you have planted the grower, remember that it is important not to water it for 5-6 days. Put the pot in the shade. If you have done everything correctly, the plant will quickly take root! – They are sown at 21°C immediately after ripening. – It is better to do it in the month of February or March. – Use bowls with soil containing the following components: sheet, light turf soil and sand. – Add some broken bricks and charcoal to the soil. 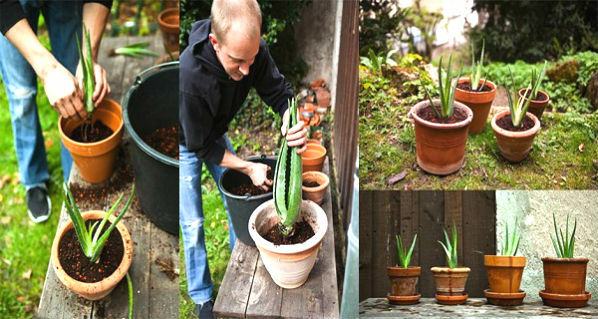 – When the little Aloe vera plants get 2 leaves, you can safely plant them in decorative pots. It is well known that the Aloe vera plant is packed full of antioxidants, which are natural immune enhancers that help combat free radicals in the body. Free radicals are unstable compounds that are very bad for your health and contribute to the premature aging process.Drinking fresh Aloe vera juice regularly gives the body a regular supply of antioxidants, which can boost and enhance the immune system. The Aloe vera is one of the natural herbs commonly used in all types of cosmetic products. It disinfects the broken skin, hydrates it, nourishes it, and accelerates the regeneration of new skin tissue. By applying fresh Aloe vera gel to your face, you can enjoy well moisturized, glowing and flawless-looking skin! 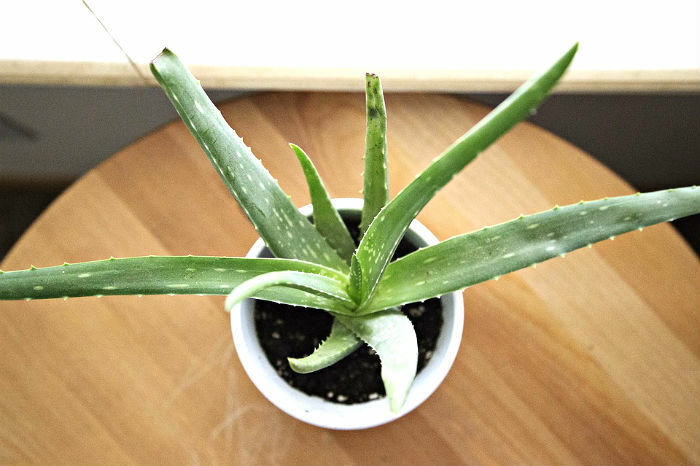 In addition, the Aloe vera can be used to treat sunburned skin, blisters, insect bites, allergic reactions, minor burns, inflammations, etc. Even people with sensitive skin can abundantly use the Aloe vera gel without any problem. Drinking the Aloe vera juice helps in natural cleansing of the digestive system. There are many artificial food substances that can cause fatigue and exhaustion, which you can eliminate by drinking Aloe vera juice. When consumed regularly, the Aloe vera juice will also help you to increase your energy and help you maintain a healthy weight. The Aloe vera is extremely good for your mouth health and gums due to its natural antibacterial and antimicrobial properties. It also contains vitamins and minerals that promote cell growth and healing of bleeding gums and mouth ulcers. If you suffer from any gum disease, just gently massage your gums with fresh Aloe vera gel. You can also sprinkle some Aloe vera powder on your toothbrush before brushing – within a few minutes your mouth will feel very clean. Drinking the Aloe vera juice also helps promote strong and healthy teeth. The Aloe vera juice has natural fiber that improves bowel movements that is aids digestion. Since it’s a natural laxative, the Aloe vera juice can also be used to treat constipation. When constipated, drink 2 ounces of Aloe vera juice daily. Remember that after taking the Aloe, it takes about 10 hours to get bowel movement. The Aloe vera can be used topically to ease local inflammation of joints and to reduce arthritis pain. Or you can drink the Aloe vera juice to reduce inflammation anywhere in your body. People who sip Aloe vera juice for 2 weeks typically begin to experience a significant reduction of inflammation and pain. The Aloe vera is also considered an excellent home remedy for mild-to-moderate ulcerative colitis because of its strong anti-inflammatory properties. Previous post: A Must Read! Women Usually Ignore These 10 Cancer Symptoms!